I had a reader send me a question yesterday. She basically wanted to use her existing .NET Framework libraries in an ASP.NET Core application, and it wasn't super clear how to do it. I have a quick question for you regarding asp.net core. We are rewriting our website using asp.net core, empty from the bottom up. We have 2 libraries written in .net 4.6 . One is our database model and repositories and the other is a project of internal utilities we use a lot. Unfortunately we cannot see how to reference these two projects in our .net core project. It can be a little confusing. As I mentioned earlier this week, some people don't realize that ASP.NET Core 1.0 (that's the web framework bit) runs on either .NET Core or .NET Framework 4.6 aka "Full Framework." When you make a new web project in Visual Studio you see (today) this dialog. Note in the dropdown at the top you can select your minimum .NET Framework version. You can select 4.6.2, if you like, but I'll do 4.5.2 to be a little more compatible. It's up to you. This dialog could use clearer text and hopefully it will soon. There's the regular ASP.NET Web Application at the top. 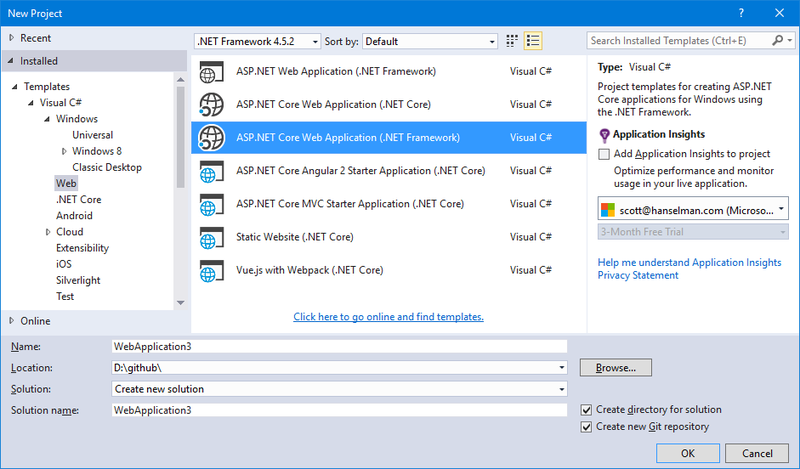 That's ASP.NET 4.6 with MVC and Web API. It runs on the .NET Framework. There's ASP.NET Core 1.0 running on .NET Core. That's cross platform. If you select that one you'll be able to run your app anywhere but you can't reference "Full" .NET Framework assemblies as they are just for Windows. If you want to run anywhere you need to use .NET Standard APIs that will run anywhere. There's ASP.NET Core 1.0 running on .NET Framework. That's the new ASP.NET Core 1.0 with unified MVC and Web API but running on the .NET Framework you run today on Windows. As we see in the diagram above, ASP.NET Core 1.0 is the new streamlined ASP.NET that can run on top of both .NET Framework (Windows) and .NET Core (Mac/Windows/Linux). I've got another DLL that I made with the regular File | New Project | Class Library. Then I reference it the usual way with Add Reference and it looks like this in the References node in Solution Explorer. Note the icon differences. Notice also that in this case it's a type="project" dependency in this case as I didn't build a NuGet package and reference that. Since the .NET Core tooling is in preview there are some gotchas when doing this today. Make sure that all your class libraries are targeting an appropriate version of the .NET Framework. For example, don't have a 4.5.2 Web App targeting a 4.6.2 Class Library. This could bite you in subtle ways if things don't line up in production. Errors in D:\github\WebApplication2\src\WebApplication2\project.json - Unable to resolve 'ClassLibrary1' for '.NETFramework,Version=v4.5.2'. Use Visual Studio to build or run msbuild at the command line. MSBuild auto-detection: using msbuild version '14.0' from 'C:\Program Files (x86)\MSBuild\14.0\bin'. I recommend you run nuget.exe to see what version you have and run nuget update -self to have it update itself. These gotchas will be fixed when the tooling is finalized. Sponsor: Big thanks to Telerik for sponsoring the blog this week! 60+ ASP.NET Core controls for every need. The most complete UI toolset for x-platform responsive web and cloud development. Try now 30 days for free! Whether the app be written in full .net framework or .net core ? Performance is too important for us. If i choose full .net is it then possible to referenced ef 6? What if you started as .net core, like the girl who asked the question and want to change to full framework ? Is it enough to update the project.json to. Resemble your example ? I still cannot get this to work, even though I am able to add a reference to the "old" class library from the "new" asp.net core web project, both msbuild and visual studio cannot resolve the reference. is there a word that has a meaning opposite to "supercalifragilisticexpialidocious"? if there is, that's the word that i'd use to describe some of the .NET Core 1.0 gotchas. Alternative libraries are available although many are works in progress. That does not mean key .NET Framework libraries will not become available in "the future", however, .NET CORE 1.0 was RTM'd June 27th, 2016(b) and is missing, among other things, System.Drawing(c, d, e) and System.Net.Mail(f). The sample references below are only the tip of the iceberg ... be careful that your legacy enterprise projects do not suffer the same fate as the Titanic while crossing over to .NET Core 1.0. (j) https://xunit.github.io/docs/getting-started-dotnet-core.html Pay attention to the notes! I was having the same issue with dotnet restore from my VSTS environment. Its very annoying that you have to do the Nuget restore trick to get things building in VSTS. I'm not seeing any progress in the github issue, is this still on your list to fix before marking the tooling as release candidate? What benefits does ASP.NET Core have over the full framework ASP.NET ? Thanks Scott for this post! Im having problems with exact opposite thing: created a .net core class lib, and want to reference it from full .net class library. Added a reference, but intellisense doesn't see the namespace or any type from core lib, and can't compile it. Any ideas? What's interesting, somehow worked once, then stopped working. But when it worked, it was complaining about Func<,>, that i need System.Runtime 4.0.2, which I added through nuget. But after it stopped working, couldn't reproduce it again. It's simply a horrible time for asp.net, .net core etc... I guess it will be easier once the tooling is updated. This has been the strength of Microsoft over the past 3 to 4 decades and why I've used it so much, but there's a push inside MS to work on an antiquated command line environment, throwing the opensource stuff in the mix. I get the feeling that there are too many rails fanboys in MS. What MS needs to do is listen to the VB people, they have always had this sense of developer productivity, but they have been sidelined because VB is probably not cool enough. We know this because core doesn't even support VB. I say MS needs to stop copying others to look cool and start doing what they do best and that's supporting the developer in his/her productivity goals. So does that mean that project.json will become more like the old-style projects with all the stuff hidden away and you do everything via property dialogs? Gerry, I unfortunately have to agree. Although .NET Core (the set of assemblies) RTMed months ago, the ecosystem did not. For serious projects that would've otherwise relied on several NuGet packages, a medium to large team of developers, working continuous integration, etc., .NET Core is simply not ready for prime-time. Microsoft declaring that something has RTMed has nearly always meant the tooling had also RTMed at the same time; however, that was not the case with .NET Core. The Visual Studio and command line tooling is far from robust, and downright buggy in many instances. Additionally, .NET Core developers--especially developers of nuget.org packages--are forced to learn and interact with project.json, a file that Microsoft has already said is deprecated in favor of MSBuild. And yet, what exactly will be replacing project.json is still an unknown. It will be many, many months before .NET Core development is as easy and seamless as .NET Framework development is today. I look forward to deploying applications in Linux someday; that day is just not today. "No connection string named 'MyEntities' could be found in the application config file." 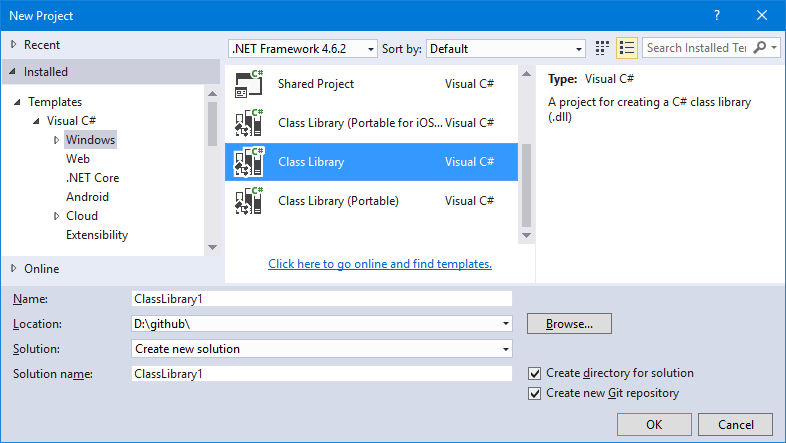 How about a blog post for references going the other way - .NET Framework class library --> .NET Core project. If I understand correctly ASP.NET Core is next main version of ASP.NET and it can use main version of .NET Framework and "forked" version: .NET Core. Why did Microsoft change its name to "Core" that suggest that it is "forked" too? I followed your instructions (new project, new class library) and can't get it work. When running .NET Core on the Traditional .NET Framework, I want to allow only a certain assembly access 4.x methods. I don't want to 'accidently' use 4.x methods throughout my project, I could designate only certain assemblies as ones that can access 4.x features. I know there's something I'm missing in configuring the project.json, but I'm having a hard time figuring it out. Thanks! Just in the process of working on a new Web Api. For various reasons we have to use an older legacy object model, build for x86, targeting .Net 4.5.1. The new WebApi is based on Asp.Net Core - and using the approach above works perfectly (after some initial struggling). Only problem I had left was the toolchain, and being able to do a "dotnet restore" - but it sounds like that is soon fixed. Sander Hammelburg, we have an N-tier web project, with our DAL as a .net4.6 core class library - we used the tools as https://github.com/mrahhal/Migrator.EF6 to help us get EntityFramework 6 working. Probably a bit off topic but that's the best place I was able to find so far. CS1508: Resource identifier 'unit-tests.invalid.json' has already been used in this assembly. Do you think it's possible to make this kind of trick with core project? Hi Scott. I have a similar issue and I am targeting .NET Framework 4.5.1. After reading your blog article on this subject I am a little unclear what TFS Online Build Process I need to change; my build works fine in VS2015 Update 3.
error: Unable to resolve 'MyNamespace.Common' for '.NETFramework,Version=v4.5.1'. log : Restore failed in 4208ms. Unable to resolve 'MyNamespace.Common' for '.NETFramework,Version=v4.5.1'. ##[error]Process completed with exit code 1. While works for primitive, empty projects, this is not currently working in real life due to "read-only on copy bug" for 3rd party DLLs referenced in Full .Net Framework project. https://github.com/dotnet/cli/pull/3794 - "error : failed to make project runnable". How do you feel about the move away from project.json to an MSBuild XML file? I'm still really confused by what is compatible with what. I always see the graphic, the first one in your post, for .NET Core 1.0 with .NET 4.6, but then you reference .NET 4.5.2 to be a "little bit more compatible"? Why does the graphic have .NET 4.6 if .NET 4.5.2 is compatible with .NET Core 1.0? What am I missing? I'm working to create a roadmap for our enterprise, but this makes it difficult to understand what we should be doing now to set ourselves up for a future move to .NET Core when other key pieces of it, libraries and tooling, become available. If you could clear up this ambiguity for me, I would greatly appreciate it! This is kind of a cop-out answer. You're basically saying "How do you reference a 4.6 Library from a .NET Core project? Make sure it doesn't target the core framework!". The fact that this situation (the state of the tooling) is SOOOO bad is shameful. By no means is .NET Core Framework really RTM. At best it's a glorified beta.